Google recently launched real estate features including home services advertising and will soon unveil a mortgage comparison tool. 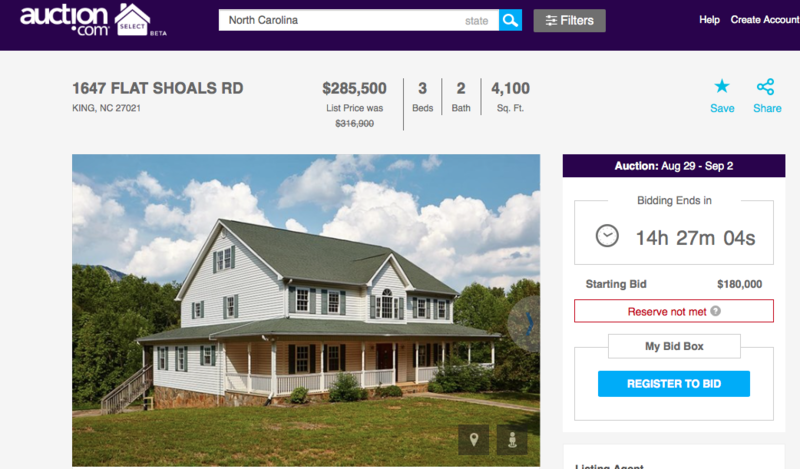 Google investment arms back two online real estate marketplaces and one agent-matching site. The Internet giant is pioneering 3-D virtual tour and smart home technology. A top-producing real estate broker recently received an invitation to attend an exclusive workshop at the headquarters of Google. The purpose of “Google Ignite Real Estate,” an invitation-only event slated for mid-September, is to stoke interest and discussion around how to use Google tools, products and data to beef up the online real estate marketing and digital strategies of real estate brands. The event highlights what appears to be growing interest from Google in the real estate industry. While Google hasn’t directly entered home sales, the Internet search giant is gravitating toward the sector from a range of angles. Here are eight ways Google is circling real estate. Google recently began allowing four types of home services professionals in the San Francisco Bay Area — plumbers, locksmiths, house cleaners and handymen — to pay for prominent exposure in search rankings. Photos, ratings and contact information of the advertisers show up in an expandable list at the top of search result pages. Only businesses that have been screened by Google can qualify for the advertising. Google wouldn’t share whether it might open the advertising program to real estate agents and brokerages. 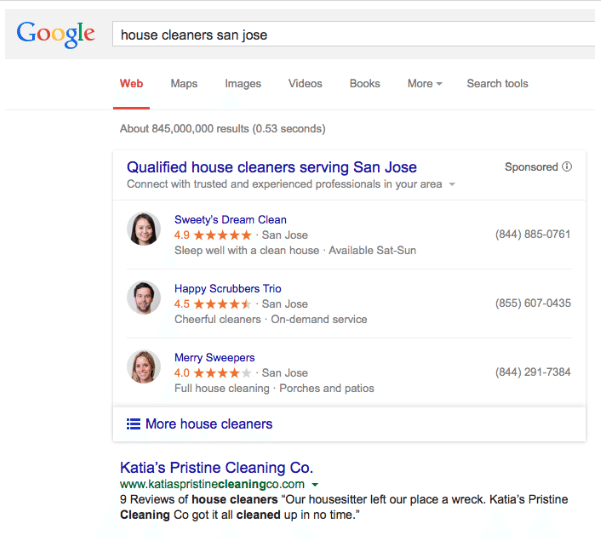 Promotional image showing example of Google’s home services ads. Google wouldn’t say why it retired a U.S. mortgage shopping tool in 2012. But the firm is gearing up to relaunch a new one by the end of the year. Google already began edging toward the mortgage market earlier this year when the firm unveiled a mortgage calculator in February that appears in search results. “Whether someone is a first-time homebuyer or looking to refinance, consumers will soon be able to find the latest mortgage rates from multiple mortgage providers, and review a customized set of criteria like interest rate, terms of the loan and fees,” Google said in a May blog post about the mortgage comparison tool it’s cooking up. What looks to be a Google subsidiary, Google Compare Mortgages Inc., acquired a mortgage loan originator license endorsement in April 2015. Google has long served up a mortgage comparison tool covering the United Kingdom. The tool shows some mortgage providers in search results and invites users to enter the size and type of mortgage they’re seeking to see quotes. It also indicates “we may be compensated by some of these providers” (in a pop-up window). 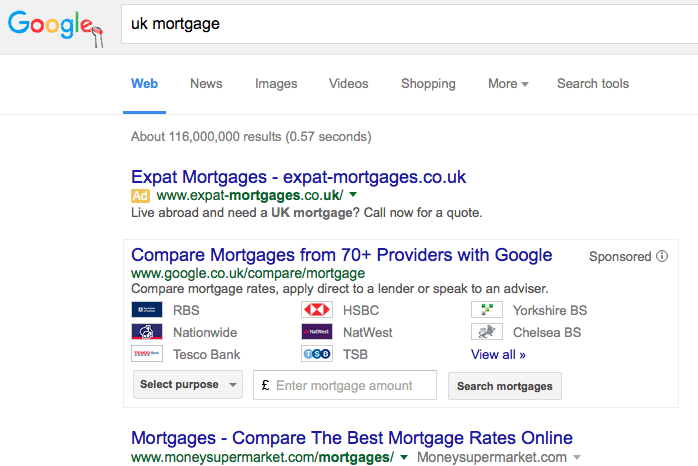 Screenshot showing Google’s United Kingdom mortgage tool. Google said its U.S. mortgage comparison tool will resemble the comparison tools it offers for auto insurance and credit cards in the U.S.
Google is circling real estate. It’s unclear how Google’s soon-to-launch U.S. mortgage tool may differ from the one it launched in 2009 and shuttered in 2012. Some speculated that scrutiny from regulators over Google’s compliance with state licensing laws influenced the company’s decision to drop its previous tool. Google wouldn’t comment on the matter. Online real estate auction platform Auction.com raised $50 million from Google Capital at a valuation of $1.2 billion in March 2014. Auction.com is one of 15 companies backed by Google Capital, a Google-owned equity fund that invests in later-stage technology companies. That’s turned out to be the case, according to Rick Sharga, executive vice president of Auction.com. While the relationship between Google and Auction.com hasn’t been outright collaborative, Google has provided plenty of “consultative” support, Sharga said. Google employees have helped Auction.com design and develop new products, including an iPad app that lets users bid for properties while on the go, Sharga said. They’ve also offered valuable digital marketing pointers to Auction.com, including best practices for Google search advertising, he said. The “Auction.com Real Estate Nowcast” is a result of support from Google and its chief economist. The Nowcast fuses industry data with Auction.com transactional data and Google search activity to predict market trends. While originally designed to help investors trade properties online, these days Auction.com is focusing more on serving everyday buyers and sellers. The real estate site recently hosted 15 auctions designed to attract “average Joe” buyers as part of a pilot program called Auction.com Select. Screenshot showing listing up for sale on Auction Select. Eight of the 15 properties sold, and six of those eight went to traditional homebuyers, according to Sharga. Buyers on Auction.com Select see list prices of homes and can make offers with financing and home inspection contingencies — not always the case on Auction.com’s traditional platform. “These are properties where real estate agents were involved in the listing and buy side,” Sharga added. HomeLight, a matching site that pairs consumers with agents based partly on agent transaction data, has raised at least $1.5 million from Google Ventures. The website has announced $4.85 million in total funding since launching in 2015. Google Ventures invests in younger startups, while Google Capital, the investment arm that poured $50 million into Auction.com, targets more mature firms. Google Ventures has provided marketing and product design support to HomeLight, as the fund often does to its more than 300 portfolio companies. HomeLight CEO Drew Uher declined to specify specific points of collaboration, but stressed that any assistance from Google Ventures comes from a team that operates independently from Google. Google has purchased a small fraction of Google Ventures-backed startups, but the fund’s president, Bill Maris, has said that he has no incentive to sell Google Ventures companies to Google. He told Quartz in May that Facebook and Yahoo have purchased more Google Ventures companies than Google itself. Uher told Inman in February that the site was typically earning a referral fee of 25 percent from agents who closed deals with leads they received from the startup. Depending on the market, HomeLight either co-represents sellers and buyers with partner agents or signs a referral agreement with them. HomeLight recently published a “top-agent” list for Sacramento, California, and plans on releasing similar rankings for other markets. The site claims to cover 75 to 80 percent of the U.S. and have data on 2 million real estate licensees. Google may have something of a window into what it takes to build a listing portal through Google Capital’s investment in India’s CommonFloor. CommonFloor claimed to be India’s leading real estate platform and boasted more than 1,000 employees when the firm announced an undisclosed amount of funding from Google Capital in January. “This investment shows that Google Capital believes in CommonFloor and our vision to transform the real estate market in India,”said Sumit Jain, co-founder and CEO of CommonFloor, in a statement at the time. In August, CommonFloor introduced 360-degree neighborhood panoramas that resemble those you can explore on Google StreetView. The only significant difference is that users can’t click inside the panoramas to change their viewpoint. They must click on positions mapped on Google Maps. Google, which popularized 360-degree photography with StreetView, is advancing virtual 3-D home tours by partnering with Matterport, the leading provider of online 3-D models of real estate listings. The two companies are working on a way to enable people to use their smartphones to capture and generate virtual 3-D models. Businesses across the country continue to hire vendors to use a version of Google’s StreetView camera to capture interactive 360-degree panoramas of their offices. Google’s BusinessView vendors could theoretically use the same cameras to produce virtual home tours for residential properties. Google wants to own the smart home. The firm bought Nest, a smart device maker that offers a pocket-size smart camera, smoke and carbon dioxide detector, thermostat and app that lets consumers control all three devices from one place. It also introduced an operating system that links together smart devices and a common language that smart appliances can use to communicate with each other outside of that operating system. You can enter an address into Google’s Project Sunroof tool to see the number of hours of usable sunlight the property receives per year, an estimate of potential net savings with the purchase of solar panels and a list of solar providers. Project Sunroof’s tool factors in Google’s database of aerial imagery and maps, 3-D modeling of a room, shadows cast by nearby structures and trees, all possible sun positions over a year, and historical cloud and temperature patterns that could impact solar energy production, according to Google.